If you’ve browsed our print magazine, you’ve likely noticed something unusual about this issue: it has three consecutive covers. Why? Good question. 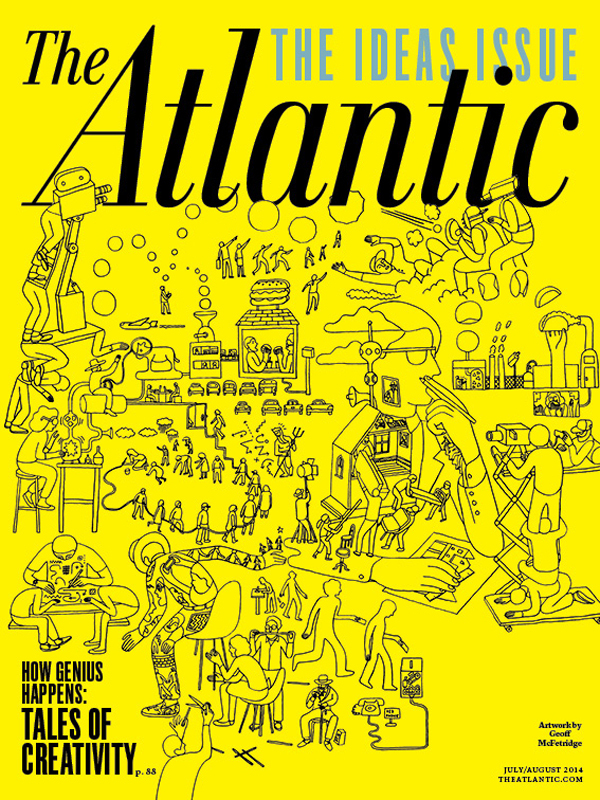 The theme of The Atlantic’s annual Ideas Issue this year is creativity— which is a hard concept to define, let alone to illustrate. We could have gone with an illuminated lightbulb, or photographed Brad Pitt painting at an easel, but those options didn’t seem very … creative. Most of the time, we derive our cover image from one specific story. But this time we thought, why not produce a collection of covers, using each one to showcase a different approach to examining and conveying creativity? 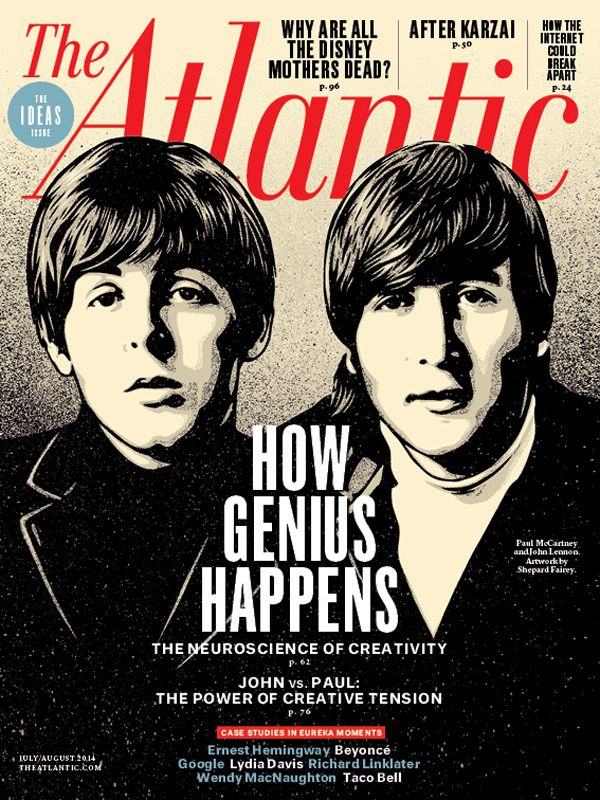 The first cover features the artist Shepard Fairey’s illustration of Paul McCartney and John Lennon. “The Power of Two,” by Joshua Wolf Shenk, uses these giants of music to demolish the myth of the lone genius, and as a case study that demonstrates how the creative friction between two disparate, even clashing personalities can yield remarkable results. To illustrate this, I wanted something iconic—and who better to create an iconic image than the skate kid who went from dodging the cops to (arguably) helping a president get elected to being an icon himself? I have a feeling that this rendering of the two Beatles will, like their music, endure for a long time. “The Creative Process” illuminates the sometimes surprising origin stories of products and cultural artifacts ranging from The Sun Also Rises to a Beyoncé music video to Google Glass to a new kind of taco. As you’ll read, the process of creating something original or useful can be at once maddening and inspiring, tedious and fun, iterative and instantaneous. On the second cover, Geoff McFetridge has managed to capture the multifarious complexity of all this. Immersing yourself in Geoff’s unmistakable style, which you can see these days everywhere from sneaker designs to Spike Jonze movies, is like looking into someone’s mind and seeing the free-ranging imagination contained therein. In “Secrets of the Creative Brain,” the neuroscientist Nancy C. Andreasen reveals the specific brain processes that give rise to both ordinary and extraordinary creativity. 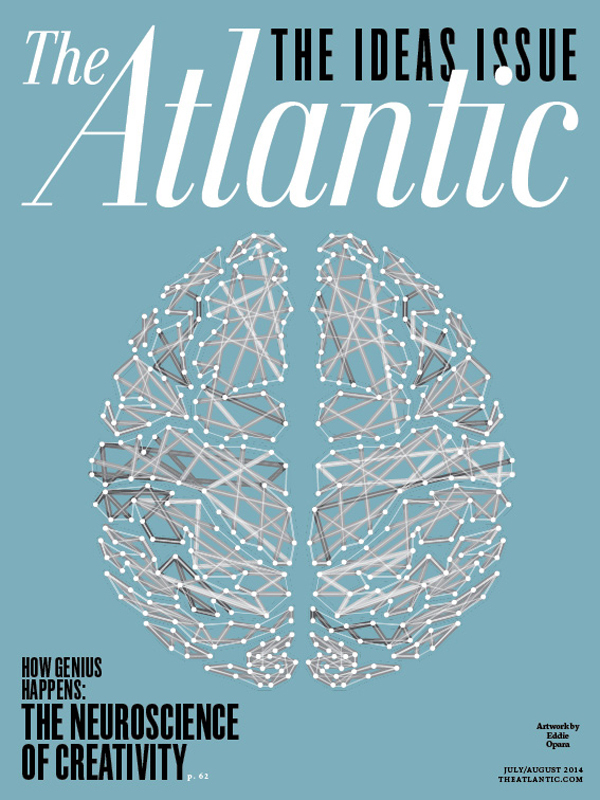 Eddie Opara, an award-winning designer who works at the nexus where art, strategy, and technology meet, has for the third cover presented the brain—an unfathomably complex organ—as an object both simple and beautiful. I hope you like these covers as much as I enjoyed collaborating with these talented creative artists. Darhil Crooks is the former creative director at The Atlantic.